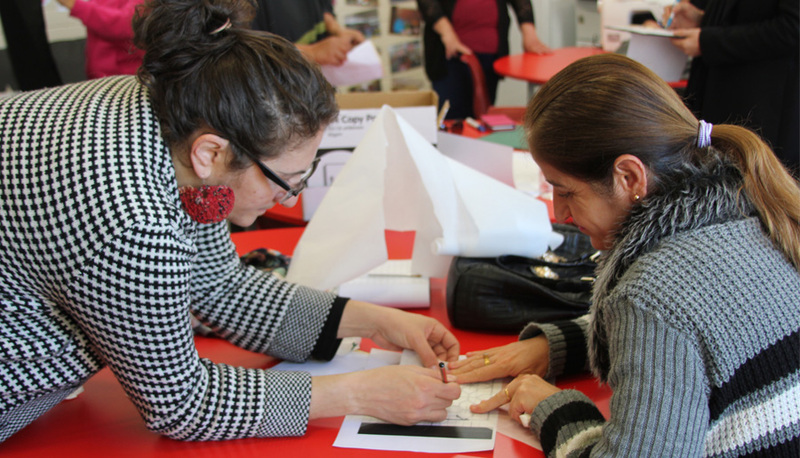 The Sewing Hub started in Term 1 engaging women who attend the Settlement Services International Community Hub based at Fairfield West Public School. The project aims to equip the ladies with sewing skills for the purpose of setting up an alteration business, as well as being able to make their own unique garments. While meeting the women who were interested in the project, we realised that Aalia had amazing self-taught sewing skills and a nice approach in teaching the group. She became the project facilitator and taught the women how to make little dresses for young children using her own daughter as a model! The women loved making the dresses amidst lots of fun, seams, stitches and threads! In Term 2 the participants worked with the fabulous textile artist Nicole Barakat who introduced the women to different techniques, fabrics and materials. Over 4 sessions, the women created their own scarves inspired by their traditional designs from Afghanistan, Iraq, Syria and Tonga. Nicole worked closely with each of the women to explore personal and intimate details using appliqué and fabric transfer techniques to revive those traditional designs. Her gentle and creative approach enabled the women to be really enthusiastic to share their personal knowledge with the group. One day that really stood out was when Kolina, who is originally from Tonga, brought her precious and much cherished “Kahoa Pulu” and “Kie Tonga” to show the group her family’s traditional, handmade pieces of clothing and jewellery. Kolina was inspired by the design of her mum’s “Kahoa Pulu”, a necklace made from coconut fibres and precious seashells, to make her own scarf. She also explained how the “Kie Tonga”, a prized woven handmade sarong made from pandanus leaves, had been passed down from generation to generation in her family from her paternal great grandfather’s side. By sharing her beautiful story, Kolina prompted the rest of the women to share their many stories of passed down textiles, carpets and scarves from different cultures. Hanifa also brought in her handmade embroidered tablecloth, which was a reflection of her family’s traditional Afghani house linen. Kolina and Hanifa then decided to collaborate in using each other’s designs on their respective scarf and the results were remarkable! The women are now looking forward to the next phase of their involvement in the Sewing Hub!